Hump Day is here!! 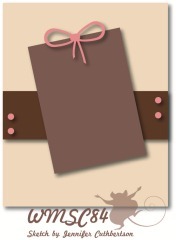 Finished my card for the Waltzingmouse Sketch Challenge. You have until Friday at noon (I believe but, check the blog for sure) to participate. Love these sketches... so many ways to interpret them... and..... by participating you are in the random draw for a free set... can't get any better than that!! Papers are from Echo Park's For the Record... getting low on these, which is good since a bought some of the new MME papers and told myself I had to use up some of the papers I had first... you know before the new ones arrived- didn't work but, I'm trying to hold off and not sure how long that's going to last!! I am my own policewoman... not doing a very good job though, haha! 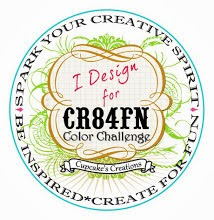 !﻿ I've been playing with WMS Vintage Circles Small a little (another goal was to ink up stamps that have been neglected) and the image on the circle nestie is from this set. 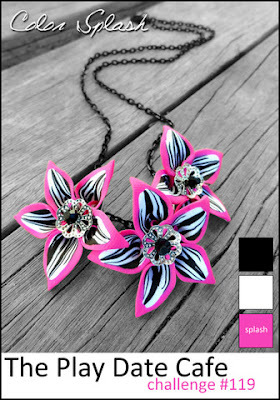 Isn't it wonderful with the polka dots and ornate square in the middle. Added a sentiment from WMS Fancy Phrases. A half doily, crinkled ribbon bow topped with a Websters Pages sparkler finished it off. Have a great Thursday... mines' going to be a little busy!! For PDCC and CASE study!! This card was made for them!! Now... 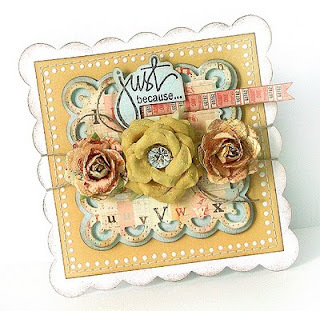 I'm tickled pink with it... because I finally used my Tim Holtz rosette die and I finally made a banner!! I know, I know... everyone out there in blogland has been doing this but, it just never "gelled" for me or I just didn't like the ones I made and had to scratch them. You may be thinking it still hasn't "gelled" but, that's okay... in my mind it did, LOL!! PDCC colors this week are Baby Blue, Orangesicle (love orangesicles my self), and Basil. I used SU Only Orange, Certainly Celery, and Baja Breeze and some dp from Authentique Gathering along with WMS Bitty Banners... yes those little banners were stamped in the SU colors and fussy cut and attached to the jute. From CASE study this month.. 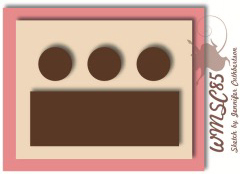 I CASE'd the rosettes, flag, and "bits and baubles" idea. Banners are Waltzingmouse Bitty Banners and sentiment is from Fancy Phrases... thought the Hurrah went perfectly with the rosettes and banner!! Ohhh.. WMS has a release this Wednesday that is "to die for" or at least I think so... IMHO!! Thanks for stopping by!! Appreciate when you take the time to leave a comment... love all the kind words!! 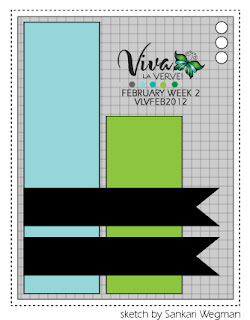 Week 3 card for the Verve sketch challenges on SCS. I even used a set that I hadn't used yet and dp I bought when my sis (Lisa) was here before the wedding. 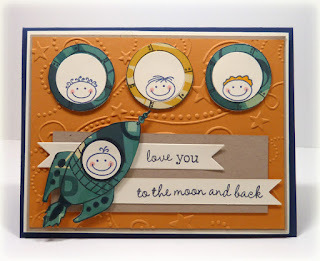 We had BIG visions of stamping until wednesday evening but, family started coming (earlier than expected, felt very blessed that they wanted to be here-Lisa and I just had our time planned out.... it's a good thing we're flexible, LOL!!) And... they all helped tremendously... couldn't have done it without them!! The sketch... a wonderful one by Laurie Schmidlin. 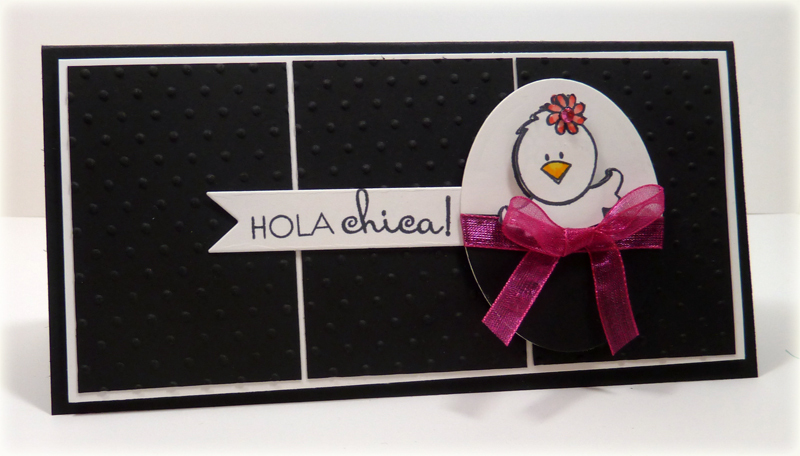 My blogging friend Marisa made so many fabulous cards with these sets and I am finally using them.. I know... SLOW!! Hope you are having a wonderful Saturday evening. I've spent the day at a bridal shower for one of my youngest' friends. Had to drive an hour each way... had lots of fun... played a game and one of the questions was asking the name of the studio she danced at (both her and my daughter danced but, at different studios)... dang, made me so mad- I could drive you there!! Could not think of the name for the life of me!! The bride to be..."You've known me for 7 years...."
Good Friday morning to you and welcome to the 4th installment of I Spy Sketches!! 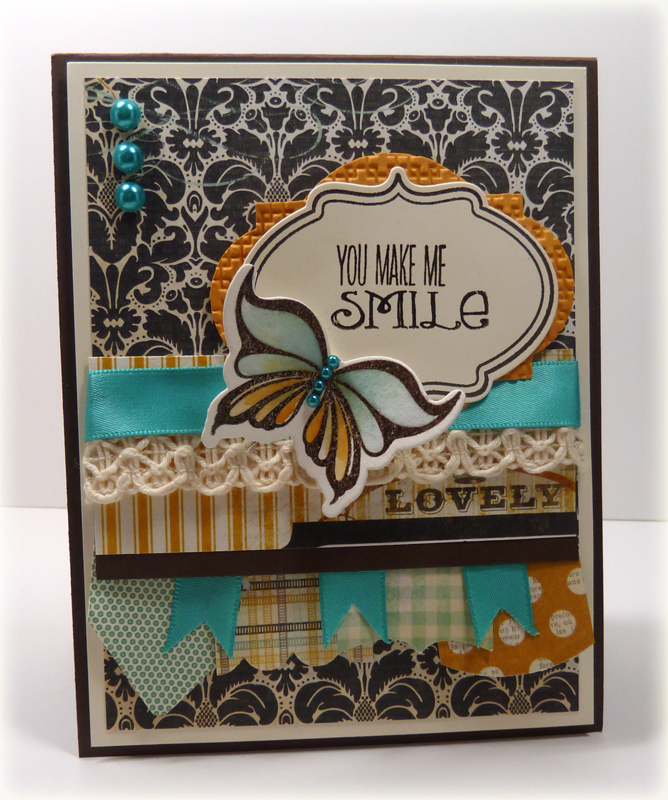 This week the sketch is based on a card by Heather Klump..you can check it out here. Realized as I was taking/editing photo that I've been "hung up" on brown with turqoise, yellow, and green. 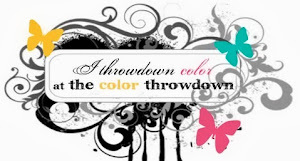 Lovin these colors... will work on a different color combo for next week, LOL!! Used Verve's Great Friends, stamped the solid outline medium flower once onto dp and then stamped two of the smaller flowers onto dp. Colored a little with copics-new experiment for me to color on dp, HA I'm fairly new at copic coloring. 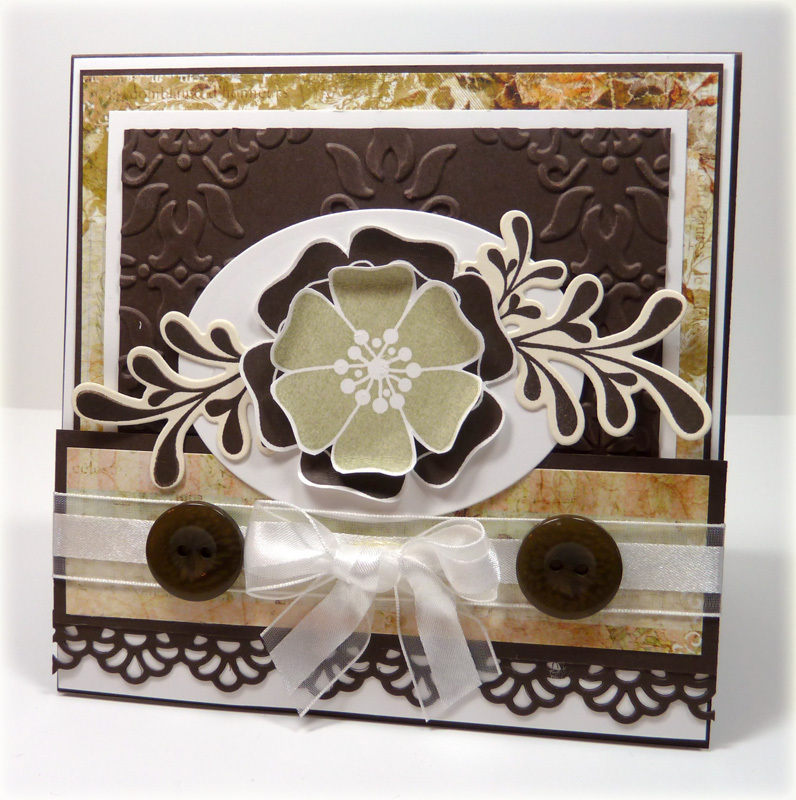 Popped the two smaller on top with some Verve leaves (Bloom & Grow set) stamped with the leaf image and heat embossed with clear, cut out with Verve's Elegant Leaves die and tucked behind the flowers. Added a border with a MS pucnh, some PTI and SU ribbon, a little pearl in the center of the top flower. 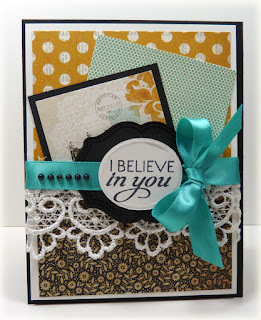 Sentiment is from Verve's Great Friend- masked and stamped and cut. To the Moon and Back.... yes, have spread my arms wide and said "Love you to Infinity" and when your kids are young. Little hard hard to explain "infinity"... except forever and always will.. no matter what!! Fell in love with these little people from WMS Half Pint Heroes. Yep, got a card done for the WMS sketch challenge this week... another by Jen Cuthbertson. Love when you stop by and... appreciate all the kind words and encouragement!! I visit...I peek at work (don't tell) on my iPad but, sometimes don't have a chance to comment... that DANG phone and, honestly I HATE Instant Messaging on microsoft word.. it's like "Vickie drop whatever you are doing and listen to me 'cause the person in front of me is not as important as me"!! Do any of you deal with that?? I think, I just went on a tangent.... sorry!! Just curious. Tomorrow's Friday and come back for an I Spy Sketch!! 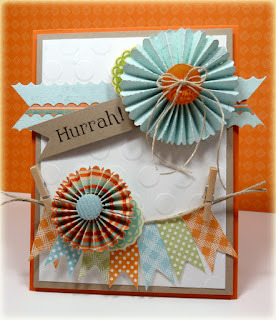 Playing with some dp that has not seen as much lovin' as it should... Authentique Uncommon-- these paper make me smile!! Ohhh.. what makes me smile more is that heart with wings....in LOVE!! 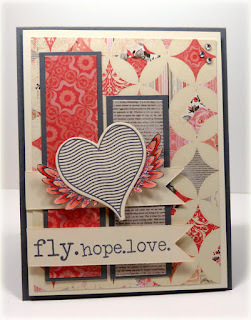 Stamped a Heart with Wings from Verve's Wings of Love and fussy cut after coloring with copics and adding a little glitter... bling...stamped another heart image in SU's basic gray and die cut with Verve's A Cut Above Die... Wavy Hearts ﻿and popped on top. Added a few rhinestones in the corner. OMG!!! 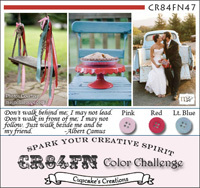 Did you see her card... hearts in two rows vertical with buttons and twine... To Die For... just sayin!! Ohh... and the "pot of gold" is to play in each of the sketch challenges for the month, link up, and you are in the running for a big ole' GC from Verve!! Thanks for stopping by...love when you make a comment and appreciate all the kind words!! Yep.... that's a buncha purple, huh!! 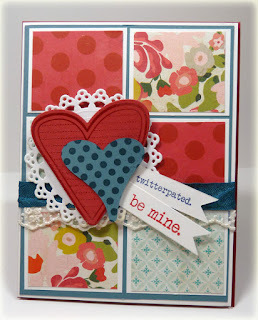 This is a 4 1/2 square﻿ layered with dp from Lilly Bee Picket Fence. 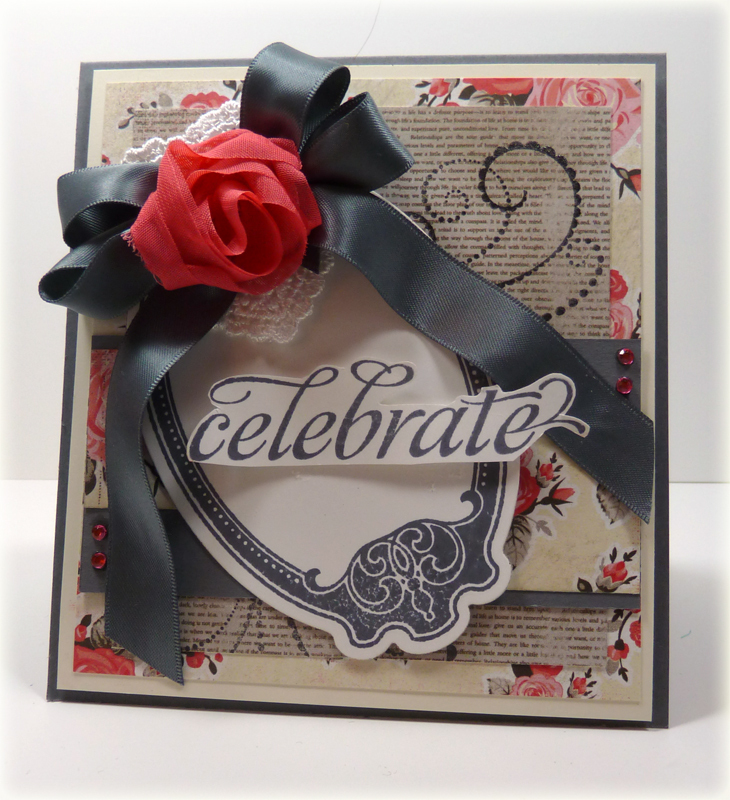 Added a border of basic gray and stamped the sentiment on a MFT Award Banner die. The flowers are Prima and the ribbon is PTI. Sunburst from Pizazzaplenty. There's still time to make a card for these challenges and it's still early on a Sunday!! Have homemade vege soup simmering on the stove and still some time to play!! Perfect!! 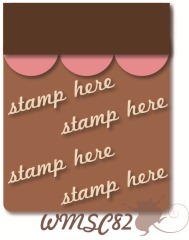 Quiet weekend here on the homefront so I'm getting a little stampin' done!! Good feeling!! 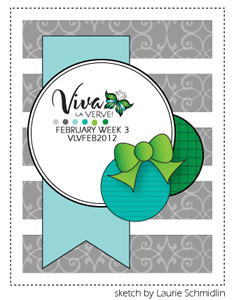 I made this card for the first week of the Verve weekly sketch challenges over on SCS. 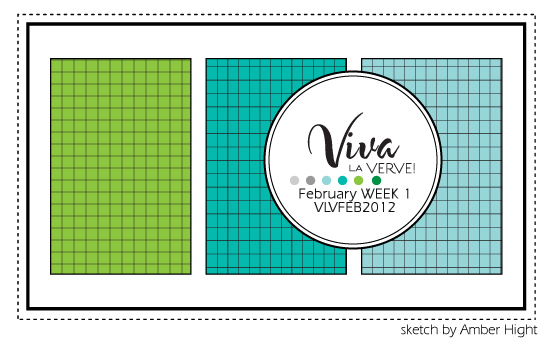 There's still time to play... make a card using each week's sketch-and YOU could be the lucky winner of a $100 GC from Verve!! Colors are from the Play Date Cafe Challenge this week... it's black/white with a splash of color--HOT PINK!! The sponsor this week at PDCC is the Twinery and you could win some twine!! Hope you're having a wonderful weekend with a little "inky" time!! Thanks for stopping by!! Appreciate all the kind words!! PS.. You can find the stamp set here and it just so happens to be on sale... Whoo Hoo... along with several other spring sets!! PSS Click on the pic to see the swiss dots.... pic taking skills at their lowest today! 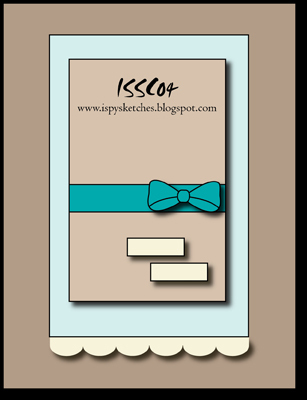 Third installment of the I Spy Sketch challenge... Kimberly Warner Teasdale is challenging us--as well as YOU!! That girl can pick some fabulous cards and some detailed sketches but, we want you to make it your own....interpret it how you fancy... that's the fun!! This week the inspiration comes from Sean Fetterman with this card. 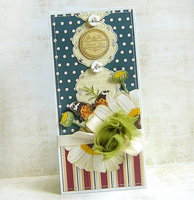 The sentiment (Verve Blue Skies) is stamped on a Verve A Cut Above Die Vintage Oval and stamped with the Verve Plain Jane Oval Frame and popped on top of a Verve Classy Label Die embossed with SU textile impressions. Used MME Lost & Found Sunshine papers and added ribbon, ribbon flags, lace, and paper flags. Made those flags a collage... rather than separate.... NOW-when I saw those flags I thought of a sketch that Leigh O'Brien (sunflowerstudio) did for a TCP Tuesday challenge which I never had a chance to "play in" ﻿(trying to direct link and can't-- you'll have to scroll through her posts but, there's some fabulous eye candy till you get there!!) Added a bunch of flags using the same dp and cutting the edges differently. Some teal ribbon flags to set it off. Lace and a watercolored Verve Butterfly. Hope you come play along.... check it out here The basis of the challenge is to "spy" a card in any online gallery or blog-- the sketch is created from the card chosen. The sketch will be posted Friday at 12:01 am (for time zones and early birds) and you have until noon the following Wednesday to create a card or project based on the sketch. THE Kim Teasdale will be picking the top 2 creations to be displayed on the "Top 2 Thursday" post. Thanks for stopping by!! Appreciate all the kind words!! Todays FRIDAY!!! 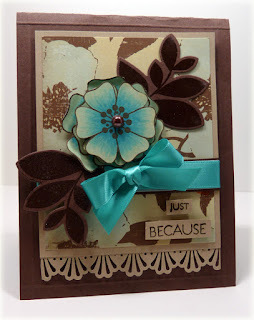 Waltzingmouse sketch challenge... love my WMS stamps and have been so busy... so I'm a "happy girl" since I got to play!! Used some Authentique Uncommon papers and SU CS for the base. 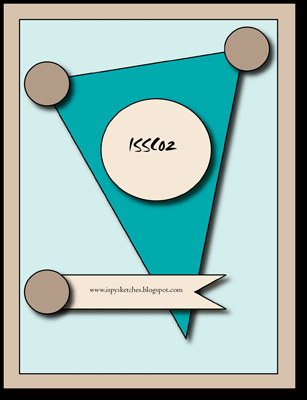 The "tilt" image uses a WMS Vintage Labels 10 and sentiment popped on top is from WMS Say It Loud. 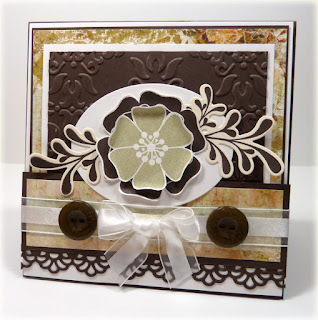 BG swirls on the gray print dp are from WMS Flourishes & Scallops & Dots. You can find the challenge here. Quick post... getting late... (haven't made supper yet) and the hordes... only 2 are wanting attention!! LOL!! Hi There and A Happy Valentine's Day!! No big plans for me today.... hubby did bring flowers home to me and my littlest (she's 19 but, will always be my littlest!!). 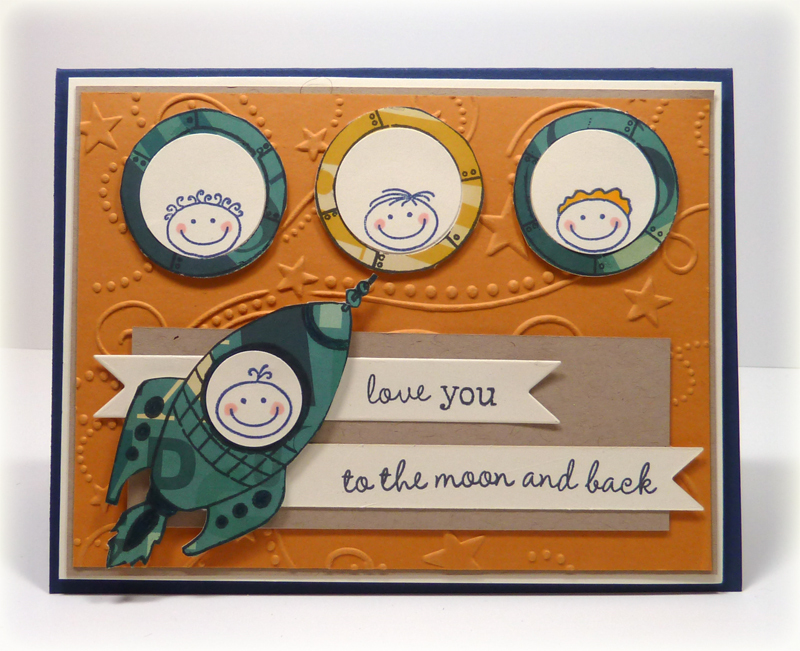 Had a little time to stamp this past weekend and was able to finish (tonite) this card for the Play Date Cafe Color Challenge... PDCC118 and the CASE study challenge 77. 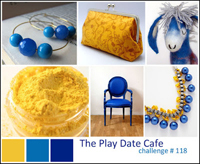 PDCC colors are and Karola Witzak is the MUSE this month for CASE study. Love her style!! Thanks for stopping by and appreciate all the encouragement/kind words!! Enjoy the rest of the week!! Got the chance to stamp a little this weekend... and played in the MOJO Monday sketch challenge (it's been eons...) Loved the skewed panels in this one (sorry, Marisa) and using some MME Lost & Found Sunshine papers... love these colors and love these papers... need justification for the new ones coming out after CHA..KWIM?? 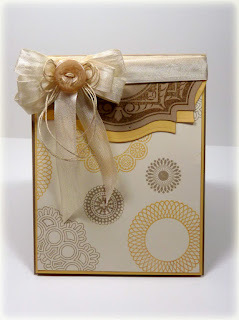 The focal sentiment/image is a Verve Curvy Bookplate die that was stamped with corresponding outline image from Tag Time in versamark and heat embossed with clear... kinda hard to see in the pics. 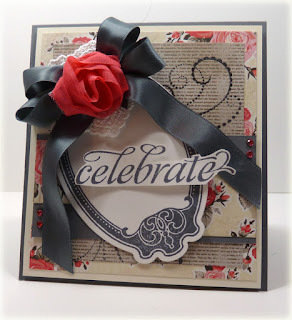 Sentiment is from Verve's Fabulous You and stamped on a Verve Embossed Oval die. 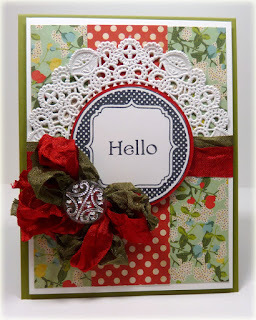 ﻿Added some ribbon and fabulous lace from Wild Orchid Crafts. Verve website here. Thanks for stopping by!! Appreciate all the kind words!! Hope you're having a wonderful weekend!! Week 2 and another fabulous sketch!! 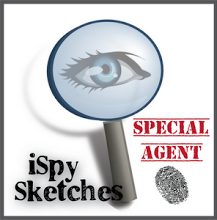 The basis of the challenge is to "spy" a card in any online gallery or blog-- the sketch is created from the card chosen. The sketch will be posted Friday at 12:01 am (for time zones and early birds) and you have until noon the following Wednesday to create a card or project based on the sketch. 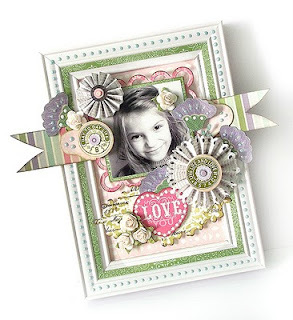 THE Kim Teasdale will be picking the top 2 creations to be displayed on the "Top 2 Thursday" post. Check it out HERE. This week Beate... yes, that's THE Beate is the inspiration for our sketch. Maybe someday I can have one of those first names- you know where they use your first name and everyone knows who you are.... not gonna' happen with Vickie!! Guess, I've lived with it this long... can live with it a little longer, hehehe!! Now... is that one adorable penguin or what!! Stamped the image on white and colored with copics (just a little coloring---made me nervous-the girls on this DT are coloring masters!! Popped on top of a white circle nestie... after using these papers (which I adore... OA Sidewalk), I wanted that penguin to standout with the bg paper-- 'cause he/she (that's still not a settled subject) is adorable!! Die and stamp are from The Cats Pajamas. Stitched a little and added some buttons. 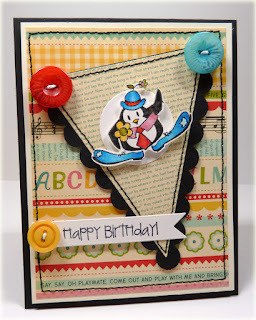 The pennant die can be found here... and Alma has lots of penguins. Thanks for stopping by!! Appreciate all the kind words!! TGIF!!! 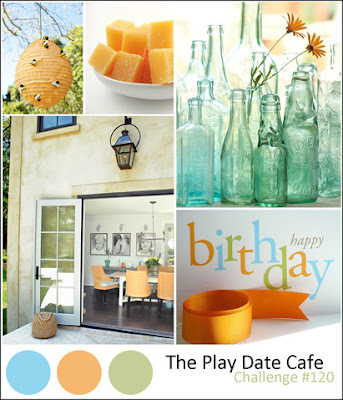 Hope you stop by and play with us at I Spy... !! Managed to get a chance to play!! This week was not quite as crazy as last week (work has slowed down a little and things are a little more settled at home). 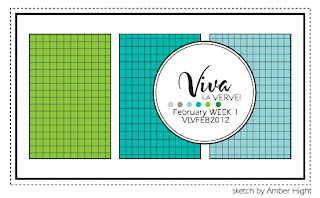 Love the WMS that Jen Cutherbertson came up with for this week... round!! Working on a smaller scale. 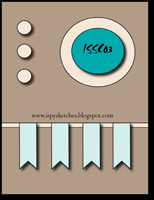 Now, when I saw the sketch and viewed the samples I wanted to use WMS Sewing Box Hugs (have had this and on my list of stamps to ink....New Years Resolution)... Black bold link is just sending you to the store 'cause I know you'll want it all.... been there, just sayin'!! I was thinking I would use the heart but, when it came time to play... I went for that sweet bird and soft colors. 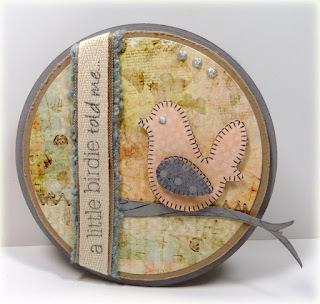 Stamped the bird image on some Pink Paislee dp and cut out the inner bird. Stamped the polka dot bg from WMS Gingham & Co. onto going gray cardstock after stamping off (second generation inking) and then, stamped the bird again to get the softer/variated gray wing) and popped on top. Stamped the sentiment from WMS Sewing Box Hugs onto twill with SU basic gray and added SU crumbcake seam binding and ribbon from my stash (can't remember who I purchased this from but, love it.... little ragged edges and a blue/gray color)--loved Kelly's sample that had the sentiment stamped in the lower corner... this is my version!! Definition..."smitten or love-struck"...Yep- lovin' it!! 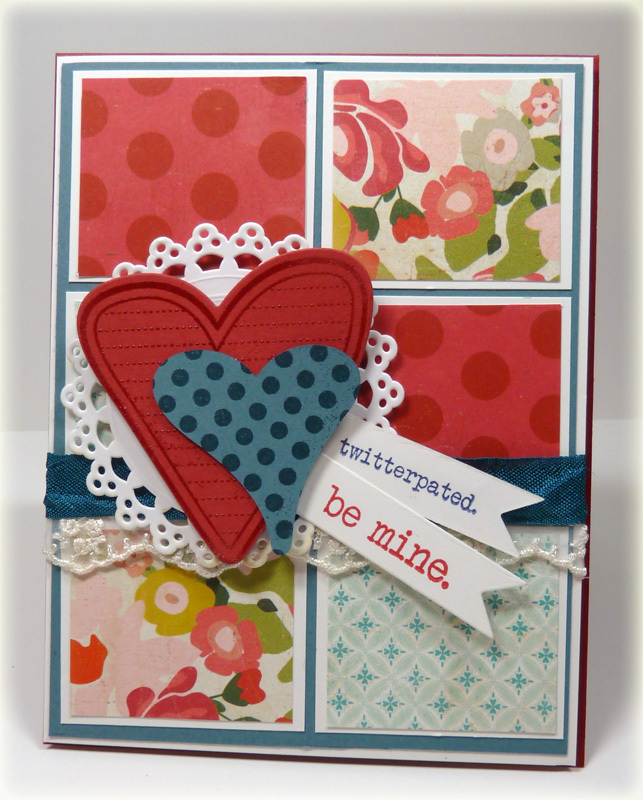 Papers are layered with SU Riding Hood Red, Not Quite Navy, and Crate Paper Paper Hearts. Used a bunch of Verve goodies... Stamped an image from Verve Jotted Hearts onto a Verve die and heat embossed with Recollections clear embossing powder, Verve Wavy Hearts Die cut out and stamped with Verve Bountiful Backgrounds (dots) with VersaMark and heat embossed with clear... Martha Stewart oval doily and tags with sentiments.... Verve Twitterpated!! Added some crinkled seam binding and lace. Love when you stop by... a md appreciate all the kind words!! Come back this Friday for the second installment of I Spy... fun new sketch challenge ... personally- I love to start with a sketch myself!! I Spy Sketch Challenge Debut!! The day has come... it's finally here!! The first sketch (ISSC01). 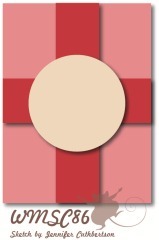 The basis of the challenge is to "spy" a card in any online gallery or blog-- the sketch is created from the card chosen. The sketch will be posted Friday at 12:01 am (for time zones and early birds) and you have until noon the following Wednesday to create a card or project based on the sketch. THE Kim Teasdale will be picking the top 2 creations to be displayed on the "Top 2 Thursday" post. Check it out HERE. 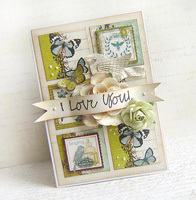 The first sketch is based on this fabulous card by Loretta Lock. 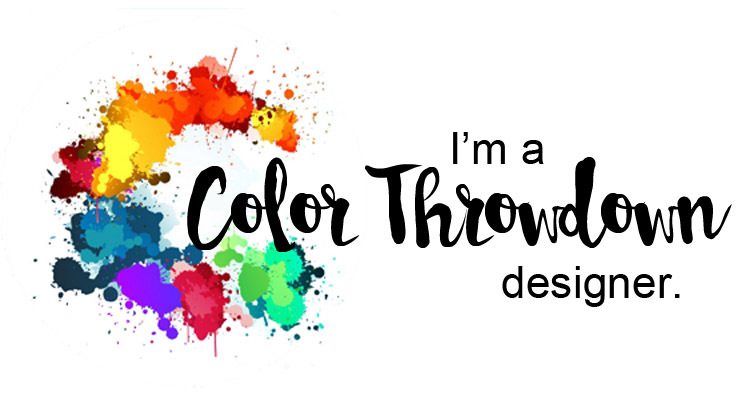 Yes, that girl can color!! Ha... you don't want to know how many times I "piddled" with this card... those three bows on the bottom "threw" me a little, LOL!! ﻿Gorgeous Verve flowers were stamped in SU Mellow Moss and Early Espresso, the leaves were stamped in early espresso and cut out with Verve's A Cut Above Die-- Leafy Sprigs. The ends of the flowers were curled with my poker (as I like to call it)- piercer. 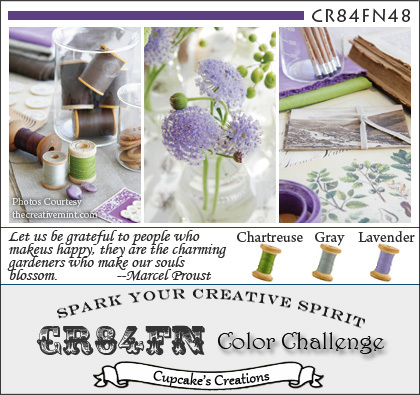 The border is an MFT die--faux crochet border. ﻿Hope you can join us.... the DT have made some fabulous cards. Just... think today is TGIF and I sooooo badly need it... it's been a rough week (work and personal)!! Thanks for stopping by. Hope you play with us!! 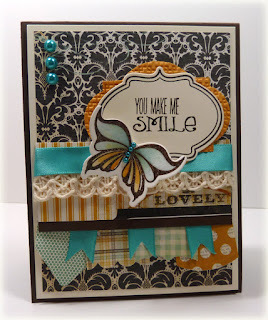 Yep... usually title by sentiment on my card.... but, no sentiment this week!!! This is short and sweet... it's been a rough week. Weekly WMS sketch challenge here. 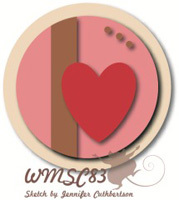 If you've never checked out Waltzingmouse stamps... you definitely need to... just sayin'!! 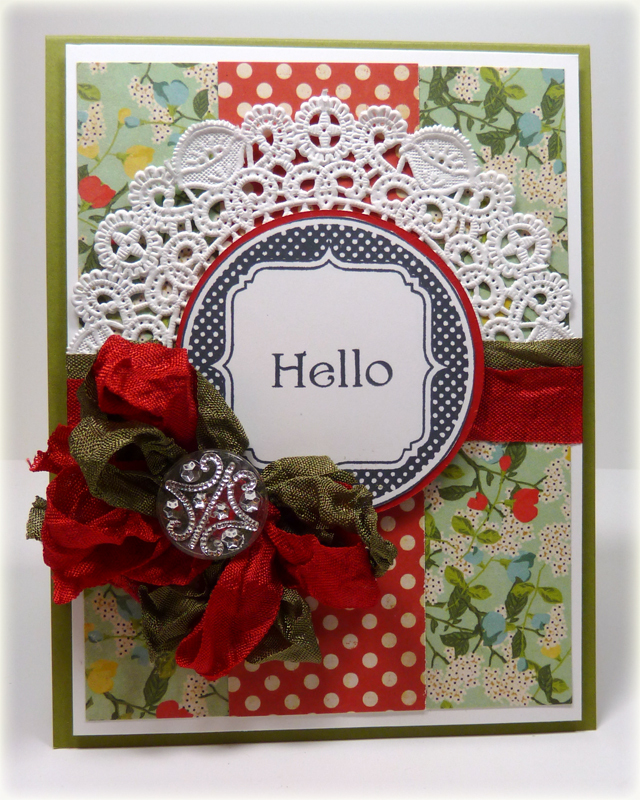 Have been wanting to use these WMS doilies as a BG and this week was perfect for me. Topper (as Edna would say) uses Spellbinders Labels 18 stamped with WMS Vintage Labels 18. Added some seam binding... TCP divine linen thread and a SU button.